Attending a Catholic university - Loyola University in Chicago - might at first sound like a strange choice for someone who became a bat mitzvah, was confirmed at a Reform temple, and spent many summers at a Jewish sleepaway camp. The majority of students identify as Roman Catholic, and the university's small Hillel meant I'd likely miss out on the many Jewish opportunities other universities offered. However, after I carefully considered the majors, programs, activities, and resources my ideal school would offer, Loyola seemed to be my best match, by far. So I accepted the school's offer and opened my mind to discovering ways to grow as a Jew at a Catholic university. Possessing a viewpoint that differs from the majority paves the way for me to teach others about Judaism and Jewish values. During one class, our teacher asked us to place ourselves in various mindsets - African American, non-English speaker, Jewish - that might affect our attitude toward school. One Catholic student commented that she did not think being Jewish would make someone feel alienated. She and others seemed to take for granted the wooden crosses that hang above every classroom door; the president's traditional priest attire of a black shirt and white collar tab; and the emphasis of religion in university life, such as the call for a moment of prayer at school-wide events. Recognizing this situation as an educational opportunity, I later spoke to this classmate about how being a Jew at a Catholic institution can sometimes feel displacing. It felt rewarding to hear her response: "Wow, I never even thought about that. Thank you." A second opportunity to share my Jewish perspective arose after Loyola's student government passed a resolution promulgated by Students for Justice in Palestine to divest university investments from eight companies that conduct business with Israel. Some students did not understand the issues involved; I explained to them what the resolution meant and why I did not support it. A number of students expressed outrage that the student government's decision was not reflective of the student body, was not well-informed or in the spirit of peaceful and open dialogue, and chose a side on the age-old conflict between Israelis and Palestinians; in this instance I presented them with a petition they could sign calling for the divestment resolution to be vetoed by the student body president. Many of these peers joined me at the meeting that eventually led to a veto of the resolution. In these and other situations, I've discovered how contributing my Jewish perspectives can lead to meaningful discussions with my peers. Learning about another religion can be a pathway to deepening your relationship with your own faith. One evening, out of curiosity, I joined a friend in attending mass. When I first saw the robed clergy parade down the nave (central part) of the chapel swinging incense-filled thuribles (censers) and carrying a lectionary (a schedule of biblical readings) along with a tall cross adorned with a golden Jesus, I instinctively thought, "How foreign this is!" But, I quickly stopped myself and instead made the conscious decision to focus on the similarities between Catholic and Jewish practices. The tradition of waving fragrant incense reminded me of how we smell sweet spices during Havdalah. The way the priest held the lectionary above his head brought to mind my hometown rabbi holding the Torah aloft during services. 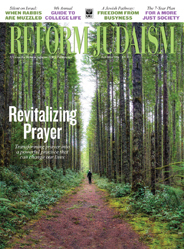 The use of call and response prayers and melodic chanting in praise of God mirrored the back and forth of the Bar'chu and rhythmic recitation of the Hebrew prayers. I soon discovered other Jewish-Catholic commonalities. Catholics forego certain tasty temptations during Lent; Jews go without leavened bread during Passover and fast on Yom Kippur. My rabbi asked congregants to wish one another "Shabbat Shalom"; priests ask people in the pews to say "Peace be with you." There are also cultural similarities: Some of my friends here wring their hands with "Catholic guilt," like my "Jewish guilt" when I forget to call my parents. By identifying commonalities - while respecting differences - I've learned about Catholicism and reinforced my own heritage. Loyola has also introduced me to Catholic practices I find compatible with my Reform mindset. One weekend on a freshmen retreat program, I was introduced to what Jesuits call examen, the daily prayer that Saint Ignatius Loyola, my school's namesake, prescribed as a time to be thankful, ask God for assistance, review the good and bad parts of your day, ask God for forgiveness, and pray for God's graces. At their root I recognized these as Jewish teachings, too. Then I realized I'd been missing something in my active college life. Where were the quiet, restorative moments I needed? At my home congregation I'd often found solace in saying the Sh'ma and in moments of silent prayer, so I decided to bring my own Jewish sensibilities to examen. I would carve out time from my busy schedule to be thankful, reflective, and humble. My reflective activities included journaling, practicing yoga, and going to Hillel. I've found other Jewish parallels in Loyola's Jesuit educational philosophy, which embodies five hallmark characteristics: commitment to excellence, faith in God and the religious experience, service that promotes justice, values-based leadership, and global awareness. Judaism also promotes education, faith, social justice, informed leadership, and global responsibility. Interestingly, seeing these same ideals reinforced in a different religious context has strengthened my Jewish faith. One day, while cleaning up a local park with other Loyola undergraduates, I saw I was among students wearing hijabs and golden cross necklaces. I was volunteering because of my dedication to tikkun olam (repairing the world), other students were helping out of different religious convictions, and all of us saw value in bettering our community. These days, when I'm asked what it is like to attend a Jesuit university as a Jew, I respond, "It is more Jewish than I ever would have imagined." Sure, there are crosses instead of mezuzot on the doors. But I've grown as a Jew by finding common ground in religious values, promoting interfaith harmony, and teaching others what I cherish in my own tradition. Carlin Coffey is a Loyola University sophomore and member of Temple Israel in Columbus, OH. Why Seek Out Jewish Life in College?